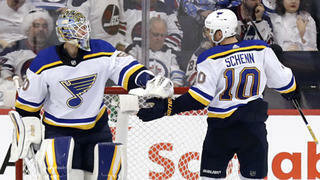 VANCOUVER, British Columbia (AP) Jacob Markstrom turned in another solid start Thursday night, and then moved on. ''There's another game in two days, that's what I'm focusing about,'' he said. The crowd at Rogers Arena broke into cheers of ''Marky! Marky!'' after the goaltender stopped a hard shot by Bozak during a Blues power play 17 minutes into the game. ''It definitely wasn't the prettiest first from us by any means. But Marky came up huge for us and made some unbelievable saves,'' Horvat said. ''It's nice to get a win but you know, we lost consecutive games before this. So we owe it to the team,'' he said. ''We just kind of dug ourselves a hole,'' he said. 06:19 - Adam Gaudette (2), Wrist Shot, Unassisted.